Hate crimes are surging under the Trump presidency. Maybe there’s a reason. The FBI is reporting that last year saw the highest increase in hate crimes since 9/11. 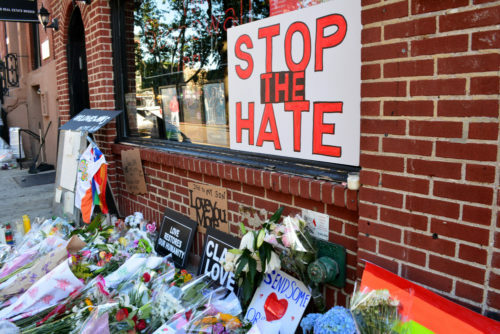 Under the Trump presidency hate crimes incidents have spiked by 17 percent this year alone with antisemitic attacks rising by double digits. Trump has repeatedly supported white nationalists, neo-Nazis, and anti-LGBTQ hate groups while holding office. The massive increase in reported hate crimes has coincided with Trump’s ascendency to the presidency. This is the third year in a row the number of incidents has grown. Over the weekend, President Trump and French President Emmanuel Macron engaged in a back and forth over Trump’s self-definition as a “nationalist” after Macron publicly chastised the American president at an event marking the end of World War I. As Trump threatened to remove American troops from Europe, Macron also renewed his call for a European military force. In response, Trump taunted Macron on Twitter for France’s defeat in World War II and insinuating that Germany was the true enemy of the French people.